Did you know that the author Mem Fox wrote the first draft of 'Possum Magic' titled 'Hush the Invisible Mouse' in 1978 and had it rejected by nine publishers over a five year period before it was accepted by Omnibus Books in Adelaide. Interesting huh! But not to my 3 year old who just wants me to read her the story. She loves the storyline about the two possum's journey around Australia eating as they go in search of what will make Hush seen again. There are many questions for me to answer when we read it, such as "what does invisible mean?" and 'what is pavlova?" and "do we have glitter and stars in the cupboard like Grandma Poss?". But when I told my daughter that we were going to make human food and have a party for Hush, there were no questions, her eyes just grew large and she exclaimed "Maybe we can make lamingtons!". It's amazing how the suggestion of a little bit of fun can make a child's imagination go into fast forward. Suddenly the beautiful gum tree outside my daughter's bedroom was occupied by Hush. But we couldn't see her, as she was invisible of course (which made playing along so much easier!). There were kisses, high fives and waves being sent from the window to that gum tree each night before bed for the next week. 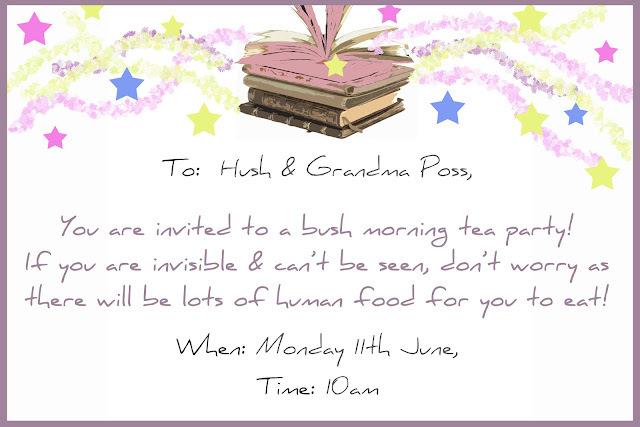 I created an invitation and then my daughter placed it in an envelope, decorated it and put it in the gum tree for Hush to find and read. I took it down that night, took out the invitation and made the back of the envelope look like it had been nibbled by a possum. Believable right?.... well to a 3 year old .... um ...... just! She has been conditioned into believing in Santa and the Easter Bunny no worries, but an invisible possum .... not so much. I got given a sideways glance when I told her the nibble was from Hush. But she didn't say anything and smiled, cause I think that she knew that if she questioned, I might tell her it wasn't really true and she has always been a child who wants to dream big and have fun! For the party we had Anzac biscuits from Adelaide, minties from Melbourne, salad from Sydney, pumpkin scones from Brisbane, vegemite sandwiches from Darwin, mini fruit pavlovas from Perth and lamingtons from Tasmania. The day we held the bush party in honour of little Hush it was very rainy, so it was perfect for staying inside and digging in! Happy reading and cooking with your little ones!! I think what I love most about your experience is they way that your daughter embraced the idea of Hush living in that gum tree. It doesn't matter if you can't see something. It's what you believe. It seems all the 'best' authors had a bit of a struggle to begin with, doesn't it make us appreciate them all the more for their struggle!?! I love that your daughter 'dreams big' - perfect! Am just going to check out that gluten-free recipe too. Glad that you had so much fun with this wonderful project from My Little Bookcase, they've got more coming up throughout the year - looking forward to watching them emerge. 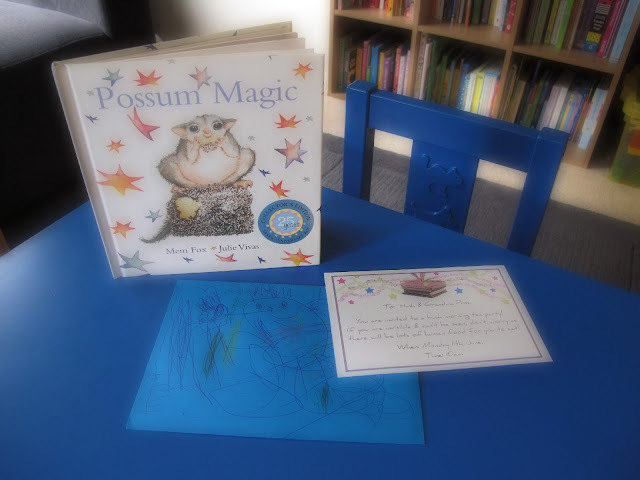 What a clever way to bring the story of 'Possum Magic' to life!!! I'm sure the Bush Party with Hush and Grandma Poss will be remembered for quite some time, as will the nibbled envelope. What a lovely book feast! 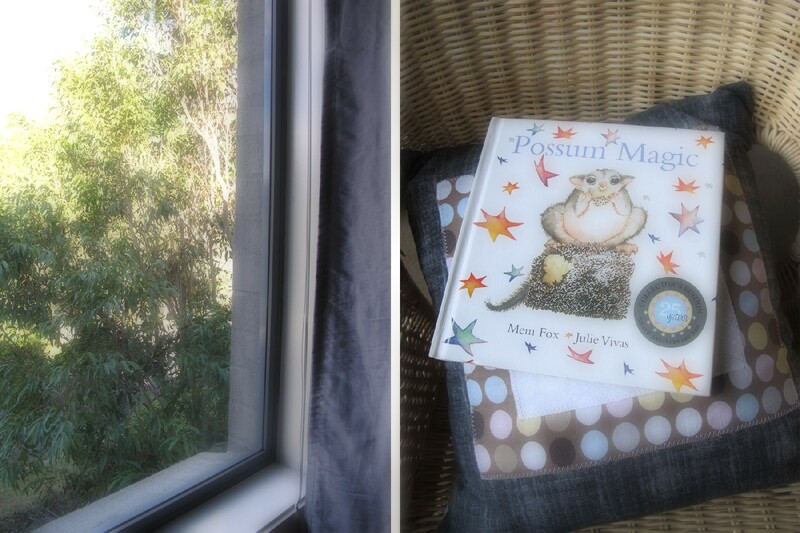 I love that you created all the food creations from 'Possum Magic' - what a huge effort. LOVE that you left the invitation in the tree- supper cute! 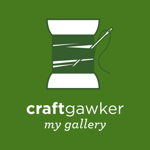 Thank you for taking the time to read my blog post and thank you for your comments! Yes, it's more interesting and real to know that even the best authors have to work hard to achieve their dreams. I love reading about the stories behind inspirational people! You've just reminded me that I have those lamingtons in the freezer. We might have to have one today! Thanks Amber! It was worth the effort to see my daughter's delight and imagination being exercised! You are going to a super huge effort with how you are documenting on your blog everyday for a year your days with your kids. You are going to have some good photos to keep by the end of it and a great record of all that you have done together. What a fun thing to do with your daughter - I can just imagine how full of magic she must have been through the whole thing! And my what a spread of tasty food!! I love this idea! I might tell the teachers at the school where I teach about your picnic! I've just shared this post on Google+ too! 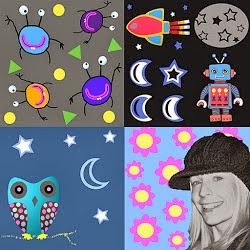 Thanks so much for sharing this post at my Say G'day linky party and for adding my button to your party page-I really appreciate that! This week's linky is now live and I am very excited to invite you to a Social media linky party that I will be hosting on July 14. The details are all at the blog if you would like to join in. This is a fabulous idea. I have read this book so many times, but never thought about making the food. Have added that to my list of kids activities I want to try on pinterest.